Frontend Interface for MURI team "curation". Backend application with ElasticSearch for searching "entities"
Backend application with Graph Database (Neo4j) for mapping the "relationship"
Data analytics platform for performing analysis on the datastore of Biograph. Backend Application is a REST API endpoints and the Frontend Applicaiton will be an Angular Framework. Entities in the application meaning - "gene", "protein", "chemical", "pathway" and "diseases". The problem with most of the biological databases, is the lack of quality or quantity of these entities. The Biograph application plans to solve this by integrating these databases. In the Data integration, the inclusion and exclusion of the entities will result in quality of the final datastore. 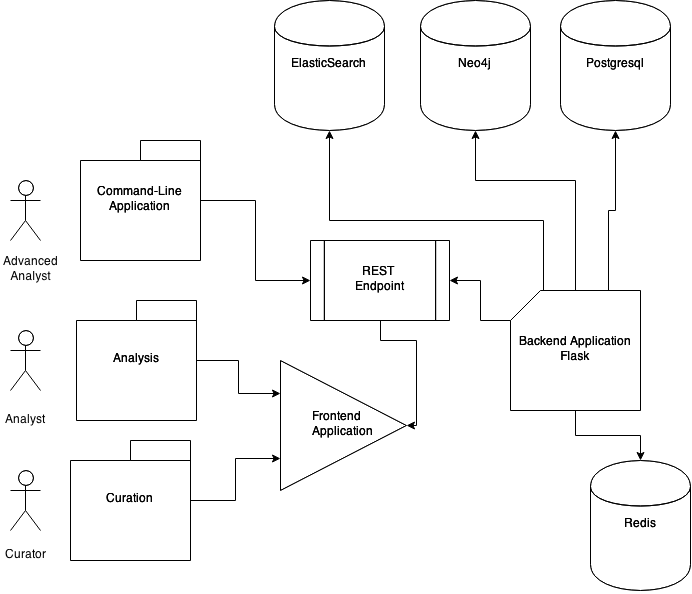 ElasticSearch is a database that can be used to unify the entities and further streamline our process in eliminating the duplication of entities. The ElasticSearch is important for curation purposes. ElasticSearch will increase the rate at which the curation is done and also eliminate duplication in relationships. The backend could be further used for text-analysis and automatic curation in the future. Entities in the graph datastore are the same - "gene", "protein", "chemical", "pathway" and "diseases". The biological databases just try to map a single relationship between entities. The Biograph application plans to solve this by able to map relation across different entities with path information. In building the datastore, the quality of the database will depend on the expressiveness of the queries and the usefulness of the query to the biologists. Neo4j is a database that will be used to store the data in a network format or graph format. The Neo4j will be important as it can do some of the data analytic's like node degree and path identification easy for the application. Neo4j will help in storing the relationship created by the curators. Data Integration - need database parsing in the format the schema entails. Graph Datastore - the quality of the relation and the scoring the relationship edges. Frontend - the intuitiveness of the interface will enable the curators to contribute towards building the database. Quality evaluation - Quality parameters for the curators. Thank you.. Any Questions ?? ?